What's Not To Like? Doesn't Everyone Come Back? 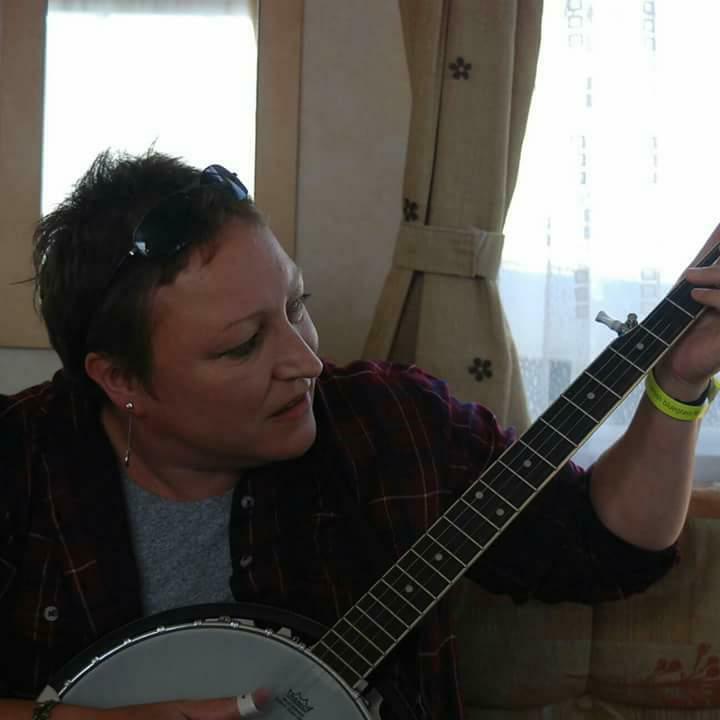 I decided to learn to play the banjo at sometime after 3am one morning in Belfast. Unable to sleep, I’d come across a claw hammer banjo clip on You Tube and it was like an epiphany, like the moment in the Blues Brothers when Elwood sees the light. I thought, ‘not only do I love this but I’m going to do this!’ That was late in 2011, and by 2012 I’d done my research, and started looking in Hobgoblin shops for a nice second hand banjo. As fate would have it, at around the same time as I bought my open-back banjo we went as a family to see a couple of bands at a local craft fair near Penzance. One was Tom Dale, who plays claw hammer, and the other was Flats and Sharps, our local bluegrass band. And for anyone who’s heard Kirk Bowman play, you can understand that I realised I had the wrong banjo. So it was going to be bluegrass! I have to add that Tom Dale was amazing too, and when I’ve perfected bluegrass banjo it will be claw hammer. Don’t hold your breath. I started by trying to teach myself via You Tube but was struggling, so I had a few lessons from a fellow in Wiltshire. He told me I had the picks on upside down, and this was a great help, and so I started learning some simple tunes. My lucky break was that talented banjo played John Dowling moved near to my home in Penwith, Cornwall. Now the journey could truly begin. Fast forward a year and my daughter Abbey, bitten by the same Flats and Sharps bluegrass bug that day at the Craft Fair, was lucky enough to get a scholarship from the British Bluegrass Music Association to go to a school called Sore Fingers in Kingham, Oxfordshire, for a week of mandolin tuition. She had heard of Sore Fingers via Flats and Sharps, who by now had become friends. So off she went – and came back ablaze! This was obviously quite a special place; Abbey told us all about it, and I decided that when I played my banjo a bit better I would go. We’ve taken Abbey and picked her up several times since! In early 2017 my husband and Abbey must have realised that I was never going to have the courage to go, and so I was bought a Sore Fingers Summer School attendance for my birthday – I would be going in April 2018. I burst into tears, both happy and terrified. I have to admit that my confidence isn’t great, and I was pretty bothered that it was going to be way beyond my capabilities. But no gain without pain! The tutors were announced some time before, and I had to choose between Bill Evans from California, who to be honest I’d only heard of as the author of Banjo For Dummies, and Leon Hunt who I’d seen pay live a few times before, and admired massively. I chose Leon Hunt, and then emailed that I’d changed my mind and was going for Bill Evans. After all I was a bit of a banjo dummy. So I had an email lodged for both tutors and no idea which it would be; at least that way I couldn’t’ be disappointed. I was confirmed in Bill Evans’s class. Now it was just a case of getting to Easter Sunday and the trip up from sunny Cornwall. I arrived with Abbey, and although it was nice to be with someone that new the ropes, it wasn’t difficult. I registered and, deciding I was going to make the most of this, immediately put my name down for a non-performing scratch band. A ‘scratch band’ is a band that is put together by the Sore Fingers team of tutors from the range of musicians who want to be involved, and it exists for that week, to either perform at the concert, or NOT perform. I was issued my name badge, on a lanyard, and to be worn at all times. I’d not been there very long when a guy I didn’t know asked me how long I’d been playing banjo, and I was gobsmacked. How did he know I played the banjo?! I thought he had incredible mind-reading abilities. But no, it was written on my badge. Then we were shown to our accommodation to unpack (think Enid Blyton’s Malory Towers) and from there off to the canteen for dinner. This was a nice surprise, everyone catching up with friends that they hadn’t seen for perhaps a year, all chatter and a buzz of excitement, hugs and smiles. I immediately felt better. I enjoyed my dinner, and then returning to the accommodation started meeting my room mates as they arrived. There were four of us, and a lovely bunch, we were all a similar age (some planning had clearly taken place here) and I found that I was the only one there who hadn’t been before. Obviously the place was addictive. I turned in early that night following the six hours on the road, looking forward to the week to come. Good thing I did, sleep is required in spades beforehand. We had had our timetables previously through the post with packing hints and general details, so the general routine is breakfast, assembly for ten minutes in the main hall, two bouts of class tuition with a tea break between, lunch, scratch band, tuition, dinner and elective class. Monday, Tuesday and Wednesday evenings offered performances by the attending tutor-musicians, Thursday night the scratch band performance and Friday night the main Tutor concert. So how was my banjo class? Firstly, to my relief, there was absolutely nothing to be worried about. Bill Evans turned out to be a first class teacher, approachable, fun and truly inspirational. I was in banjo heaven. The class proved to be pitched just right for me, certainly challenging, but I rarely felt lost (oh, that single string stuff!). We were given handouts to back up what Bill taught, after trying to play tunes by ear. In terms of the class ability certainly there were Sore Fingers stalwarts who had clearly been several times before and who were streaks ahead, but there were also newbies like myself. I think the least experienced of the class had been playing for two years, so I was towards the lower end, but it was OK. It was all about learning and no one was ever put on the spot. Having initially asked the class what points they wanted to cover, Bill touched on all of these and more besides. By the end of the week we were all becoming slightly unhinged, certainly it’s a tough schedule! But boy did I learn a lot. Bill mentioned to us that, of all the music camps he runs, Sore Fingers is his favourite, that he prefers it to all the US camps. He says it has it all, and it holds a special place in his heart. I felt very lucky. My scratch band lessons were for a mock performance, a ’contra-band’. There were daily lessons, each with a different tutor. Our band consisted of two bluegrass banjos, an old time banjo, a fiddle, an autoharp, a mandolin and a guitar. We discussed the role of the instruments in the band, chose four tunes which we arranged and played with various members taking breaks and singing, and were given tips on how to improve our sound. No one was compelled to do anything they weren’t comfortable with. I decided to try singing, and found that it was OK, just tricky when laughing. But I was well outside my comfort zone. Once I froze playing a banjo solo and couldn’t think what the heck to play. But we all had moments like this in varying degrees, and it was laughed off, part of the process. Having different tutors, who discussed different aspects, was a great idea, and we all grew in confidence, but mostly it was good fun. When we presented our mock performance, I stoodand played the banjo! I hadn’t expected that, it had never crossed my mind. All in all, this was a great experience and I’m so glad I put my name down. I found it tricky to decide which course to elect each day, but as on the first day I chose Music Theory, and this ran over several days, I did plump for that. This was basic music theory for bluegrass musicians, and was so very well presented that it was very easy to digest. The tutor who ran this class was Peter Earle and he’s great, full of energy and enthusiasm. But on the last day of the elective classes I stood him up and went to Jack Tuttle’s Listening to Bluegrass Music Critically course. I’m so glad I did (although my music theory has a hole in it!) as Jack’s course was fascinating, and I now listen to bluegrass with his words in mind; what an amazing opportunity to hear an American Bluegrass legend talk us through several well-chosen bluegrass classic tracks. He talked about the intros, the length of breaks, where the licks were added and who was adding them, the parts of the harmony, the structure of the music… You could’ve heard a pin drop, we lapped it up. One of the foremost attractions of the Summer School must surely be the opportunity to jam with other like-minded musicians. I was very keen to join in, and every night in the canteen area there was a slow jam run by the lovely Kevin Shannon and attended by many, where I plinked and plonked, sometimes the plinks were OK and the plonks weren’t! But it was all good fun, and so, towards the end of the week I tacked onto the edge of a jam as they were playing Salt Creek, and I know that one backwards. Argh, totally forgot it in the panic of the moment, why did my brain do that! But overall the progress (at the slow jam at least) was good. I guess no point trying to run before you can walk. Much of the jamming that I listened to in the bar area through the week (and in various areas nearby) put a big smile on my face. One day I’d love to join them all! Especially with Will Pinnock and his rendition of Will The Circle Be Unbroken, complete with hurtling turtles. Of course, with all these outstanding bluegrass and old time musicians gathered in one place, there are inevitably going to HAVE to be concerts. But what concerts! The most unexpected combinations of musicians, that have more than likely never played together before, and who took the opportunity to practice and then to perform something altogether and to great effect: Leon Hunt with Jason Titley, Todd Phillips and Matt Flinner; Jack Tuttle with Ron Block, Bill Evans, Eleanor Wilkie and Ivan Rosenberg; Leon Hunt playing with Chris Coole; Brian Wicklund with Ron Block, Eleanor Wilkie, Bill Evans and Matt Flinner… So many amazing performances, it’s just not possible to mention them all. And then – the scratch band concert night. What a brilliant night, everyone whooping for breaks, some cracking arrangements and unexpected tunes, and the standard was so very high, especially considering that these bands were put together just for the week. It felt like watching someone from your family perform, I felt so proud of them all! It just shows what can be achieved, but I have to say they’ve all got some courage. Performing at Sore Fingers must be extraordinary, both the most welcoming crowd and potentially the most critical at the same time. And to play in front of so many of your friends is surely not an easy thing to do. The atmosphere in the bar that night was electric! And of course, the opportunity to purchase old time and bluegrass recordings and instructional books, DVDs, tab books, guitar straps and other such items. It hadn’t occurred to me what a great place for shopping it would be; some of the items are not available elsewhere. I was so glad I took a wad of cash - which disappeared. The drive home became a voyage of discovery as new CDs were swapped out, we contemplated travelling back to Cornwall via John O’Groats. Holey moley, the week was a whirl. I’ve not mentioned the whole school playing Lonesome Road Blues together, or the ceilidh, I could go on! This week was full on flat-out finger-pickin’ good. I have taken so much away from it, and thought about it since so very often. Will I be back? Well, Sore Fingers Summer School is a truly unique gathering of musicians who share a love for similar music, whose aims are to improve their playing, meet other people and play with them, and have a lot of fun and a few beers along the way. What’s not to like! Doesn’t everyone come back? !